I Am the Christ spirit, the knowable essence of God, the source of all divine revelation. I Am the pure source of knowledge that speaks to man every thousand years, through a messenger of God. I Am the One the current messenger signs the Covenant with. I Am the source of every good thing on earth, both material and Spiritual. I Am the path to spiritual Peace and Prosperity. I Am the one you earnestly seek day and night in your deepest prayers. Ask and I Am will be given to you. Knock and I Am will answer the door. I Am the royal rebirth. Speak the words and I Am will be given to you. Their are no restrictions on Love in this new age for I Am the new age! To Be a follower of I Am is to Be a Christian. Men of all religions can be Christians once they recognise that their personal divine messenger was a follower of the Christ Spirit! The first master I met was a Christian who was a “Muslim.” He went too Mohamed, through Mohamed to I AM. Many people of many religions are simply followers of the manifestation of God, not followers of God/I Am. So a christian tends to be a jesus-ite. A jew tends to be a Moses-ite and muslim a Mohamed-ite. You can tell the difference because an “ite” lives by the rules and has very little tolerance whilst a Christ-ian lives by God’s Love and the higher laws of the universe. The “ite” lives by his tongue, the “ian” lives by his actions! What a difference! You will find the “Ian” detached from the little things of life, open to laughter (spiritual relaxation), open to music (Spiritual relaxation and upliftment), open to Gifting (service) and open to unconditional Love of God, himself and others. You will know him by his deeds, not by his words! Graduation degree way back in 1990. It means Hand (J) of (‘) I Am. No mistaking God’s intent there! Lol! In this new age the peoples of the earth are to move out from under the umbrellas of religion to the sunshine of Peace and Prosperity for the world under I Am. This is to come into being in the next 20 years and will be in place by 2035. To this end God gave me the Wholistic Peace and Prosperity Network in 1992. This is the spiritual solution to economic problems for us (His children) and the world(His family). It is for the individual first and foremost – the governments of the world will follow where the people lead! To follow I Am we have to submit our spiritual will to the will of God. This is hard and yet easy. It is hard to let go of our egos and try to “control it all!” Yet it is easy to live without controlling and controls, other than the will of God! The will of God is always based in the higher laws of Justice and Love. Justice and Love are paradise and heaven. Submission to the will of God is the hardest thing to do for christians(Jesus-ites) because submission to the will of God was exactly what Jesus was meaning when he said, “I have yet many things to say unto you, but ye cannot bear them now.” [John 16:12] Submission to the will of God would come 700 years later, and yet this was not meant for mankind as a whole, only only given to a tiny part of the world. In 1844 this ruling was declared for the whole earth and today it has not spread far. Gandhi was one of the first to broadcast it abroad in the physical level. So the churches evolved into “Water” churches where the “Fire/Spiritual” aspect was played down. Yet it is the fire aspect we were told to pursue by Jesus, the Christ. Water is the knowledge of God, Fire is the actions of God!. We can only perform the actions of God by awakening our own God aspect. We can only awaken our own God aspect by submitting to the will (the method, the higher laws) of God! Know that the path to royal rebirth is known as The 10th Path. This is because there are Nine Messengers from God and most people go too the messenger and through the messenger (if they are lucky). The 10th Path goes straight to I Am (The Holy, the Christ spirit) and back to all the messengers of God! That is the fundamental difference between a rebirth and a royal rebirth. Gandhi had a royal rebirth! He was a Hindu who read the Bible and Koran equally! How do I have a royal rebirth? Simply ask! It is good if you are an atheist or a “hatch, match and dispatch” (christenings, wedding and funerals) believer because you are not too corrupted by the teachings of man and will have an easier path to God. What to say? “Lord I want to meet you at the highest level, the 10th level, as soon as possible in good and Godly circumstances!” And that is all you need to do. I was sent a Jesus-ite who helped me over some problems, with prayers for me. When I was reborn I was sent to the place God wanted me to go and my Jesus-ite friend put me through two exorcisms and wanted to go for a third! “Don’t be crazy” I said, “You can’t exorcise God our of a person!” The first two I went through because I was so spiritually naive! The 10th Path is not a religion – God has no religion, only man has religion. The 10th Path is the highest calling of/to God. You will be guided to where you need to go, will be told what you need to do, will be assisted every step of the way in your task in creating a new Divine Civilisation. Those three things I can promise you, so fear not, have courage, be brave enough to ASK and set the ball rolling! You will never regret it! Ever! 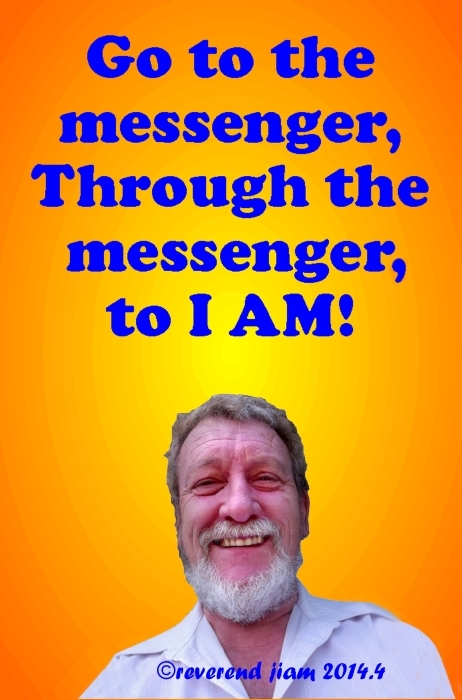 Every messenger from God always leads us to I Am. I Am is the knowable essence of God, also know as “The Christ” (Holy Spirit). So when Jesus went into the desert and fasted for 40 days and 40 nights, he went inn as Jesus and came out as Jesus, “the Christ”. The christian’s think Jesus’s last name was Christ – no it wasn’t. People in those days didn’t have last names and used their home town as that, so Jesus was known as Jesus of Nazareth. Of course after receiving the Holy spirit His home town changed from the physical to the spiritual so he became known as Jesus (of) Christ! Jesus, the Christ, is actually two separate entities. There is Jesus the very great, very wise metaphysician and prophet. And then there is the Christ contained within Him. As followers of God we have three choices, to follow a messenger of God (Jesus, Mohammed, Budha, etc.) or to follow the Christ Spirit, I Am. Or to follow both – (Jesus AND Christ, Muhammed AND Christ, Budha AND Christ, etc.) So our choices are the physical either/or, or the spiritual AND. Either/or is always divisive – christians hate muslims and muslims hate christians (notice the small c’s and m’s) Whilst AND is always Uniting: Chistians Love all people. And Christians includes Muslims, Hindus, Budhists, Jews and even Atheists and other non-religious people! As Christians we can follow any, and all, of the great manifestations (Jesus, Muhammed, Baha’u’llah etc). We can pick up any holy writings and recognise the Voice of God as “I Am” within those writings! My name is J’iam, which means “Hod of I Am” Hod is an ancient babylonian bricklayers tool that literally means “extra hand” So I am the hand of I Am. I Am is the knowable divine essence of God (And God IS Love) so my name means “Servant of Love” My other two names are Rev and Mas, which mean reverend and master. Reverend means “servant of people” whilst master means “servant of Man” . So lined up my names mean servant of people (physical), servant of Man (metaphysical) and servant of God/Love (Spiritual). WOW! I think God gave me that name to remind me that I am His servant! Lol! Most religions today are justs cults (“beware of false prophets bearing my name!”). If you want to know the Christ Spirit all you have to do is ask out aloud, perhaps with these words, “God if the christ spirit exists please show me! Allow me to be reborn into the Christ spirit!” and then be prepared to meet God! Be prepared to cast off your fears, doubts and worries! Be prepared to find God in the humblest piece of grass, or in the song of a bird or in the eyes of another Christian (regardless of what Faith they follow) Lol! God is Good, God is great, God is Mighty, Amen. Amen, Amen!